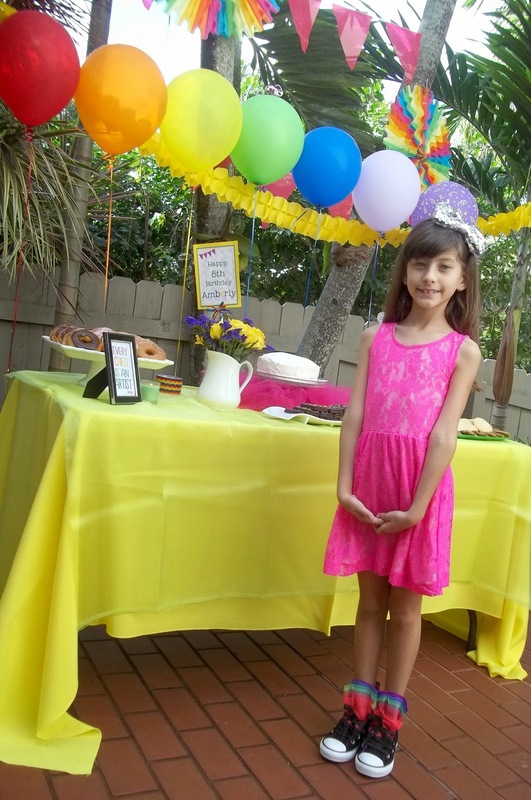 Back in December, we celebrated Amberly's 8th birthday with a Rainbow Art Party. This was her first birthday party and I wanted to make it extra special. We could have gone with princesses or fashion or any typical girly themes, but I decided on a colorful art theme. This girl lives and breathes art, drawing, painting and crafts. This was the perfect theme for her! Of all the parties I plan, this was probably the most nerve-wracking. I know nothing about art or painting and I drove JC nuts asking him what to buy. I also wanted to make sure it was super colorful. I am so grateful it was a nice sunny day. The weekend before the party, JC decided that Amberly's outfit needed to be perfect. He went to the store and picked out her pink dress and Converse. Of course, I added on a headband with a bow! I made a last minute tye-dye cake and frosted it in white buttercream. I'm sorry but I didn't get pictures of it cut! (Bad blogger, bad!) 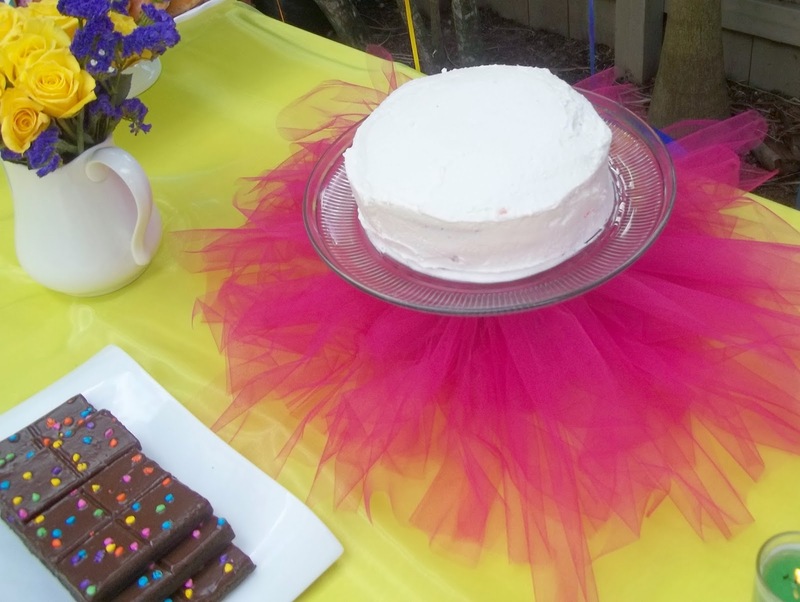 I also made a tulle tutu for the cake stand. Tutu's rock! Since the party theme was art, our main event had to be painting canvases. 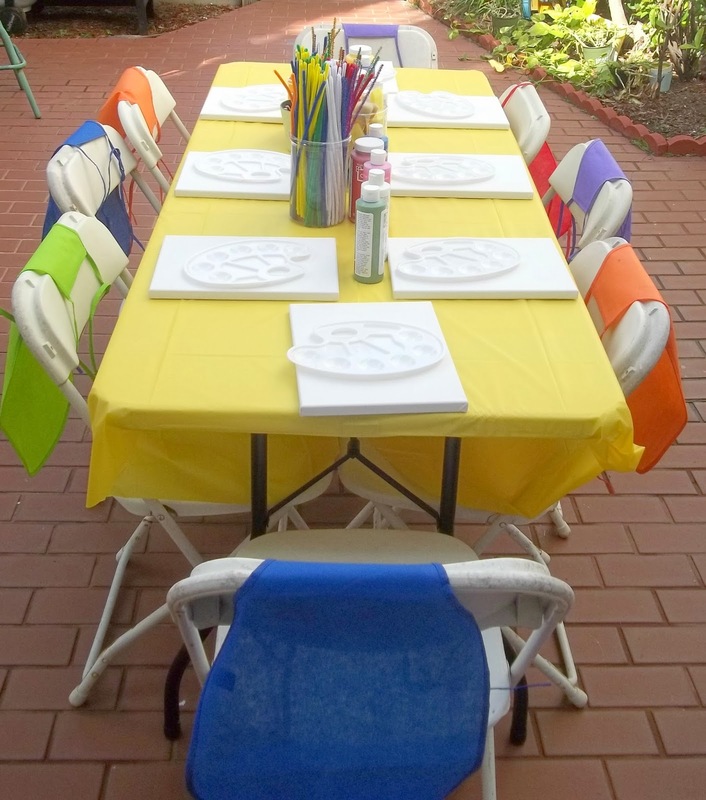 I ordered aprons for all the kids to wear, made sure there were enough paint palettes and set up this table with canvases, paint and paintbrushes that I bought at Michael's. The rainbow of balloons was her favorite! I ordered these cupcakes from a local bakery and I created the toppers. Every girl needs flowers on her birthday!! I made sure the boys were dressed in the same colorful scheme. This area was a photo booth area where the kids took pictures with oversized sunglasses, clown noses and random objects I pulled out of the toy area. I did manage to get a nice picture of all three. The kids loved the painting. They painted for over an hour! Here is the super happy birthday girl! I also had a bracelet making station and a headband decorating station. There was also a spontaneous freeze dance session that got lots of laughs. This is probably my most favorite picture of that day. JC doting on Amberly and her holding up her masterpiece! There is so much love in this picture. All in all, we had a wonderful time and Amebrly says she loved every minute of it. 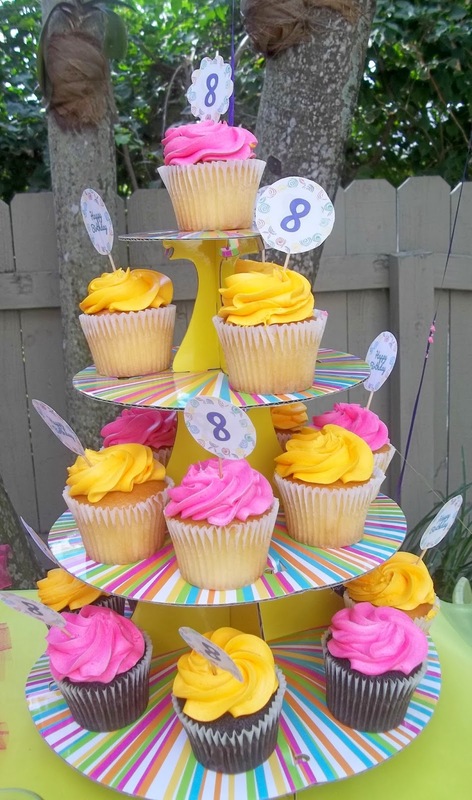 Oh my goodness what a fun party theme!!! You did a great job. I love the painting idea. I had planned on doing this for my son's first birthday in May. 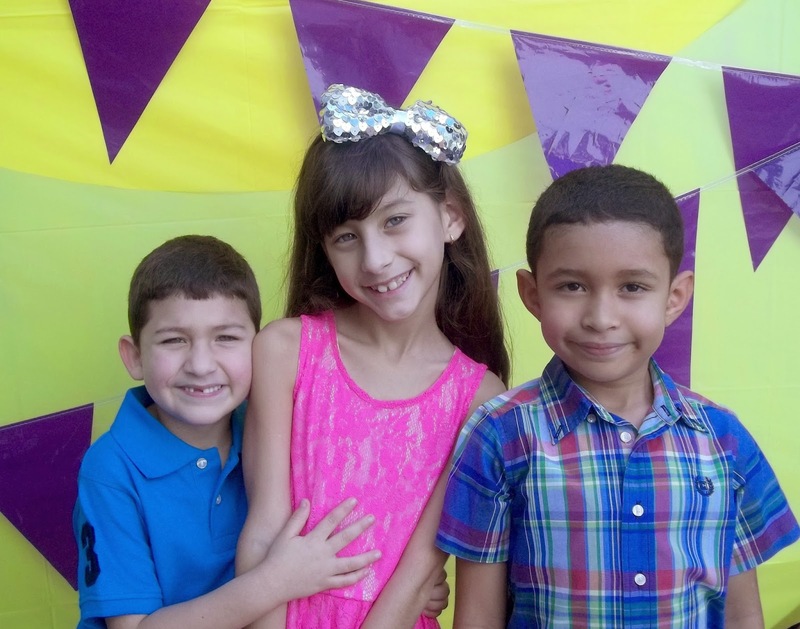 The kids look like they had such a good time. Love it! It was very fun. The painting gets messy but the children really enjoyed it!! I love rainbow everything! 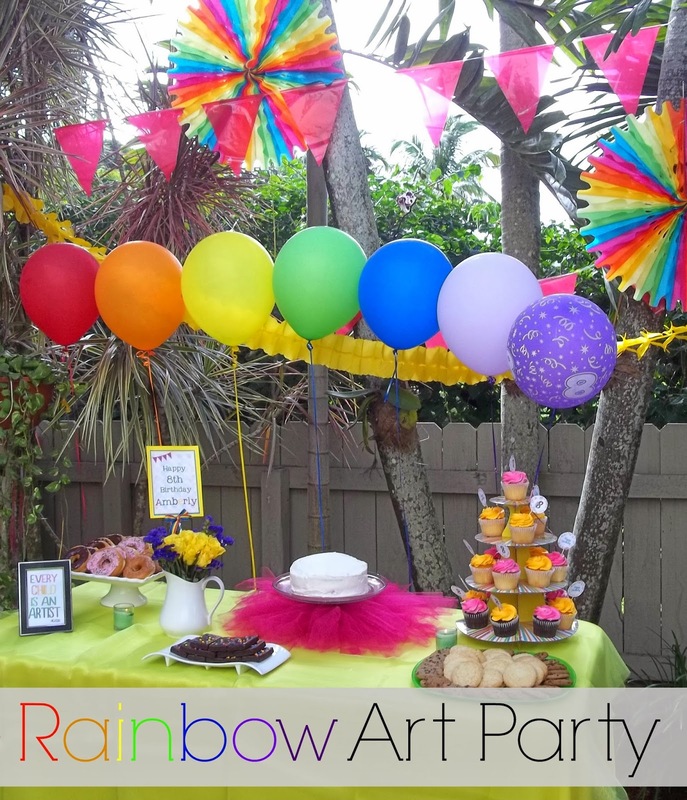 And I've always wanted to throw a rainbow birthday party. One day. She does look so happy! I think this would be a super fun theme for Scarlet. You just give her a paintbrush and set her free!! I had a super happy little girl that day! It turned out so cute. It looks like all the kids had a great time. 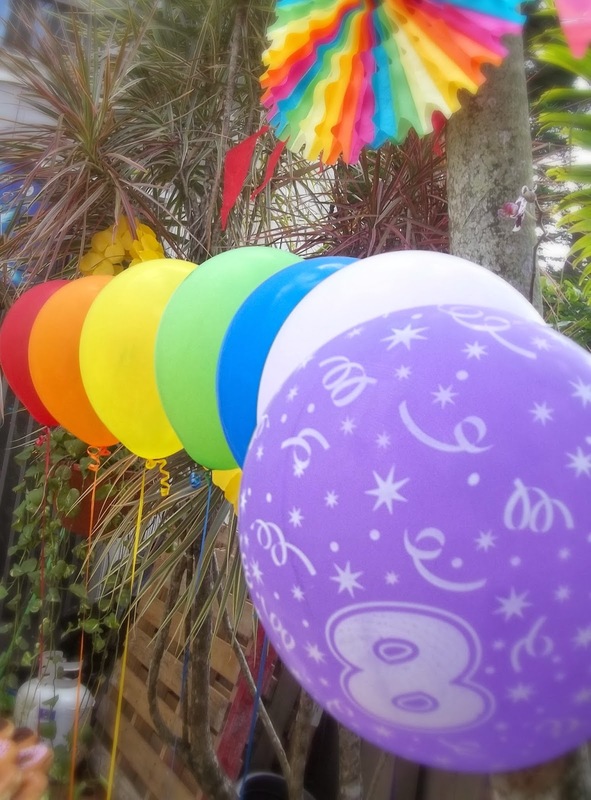 The rainbow birthday party is so darling and the decorations are the best! Join us over at Simply BeBetsy Merrymakers - love to see your post. Oh this is adorable! Love how it all turned out. 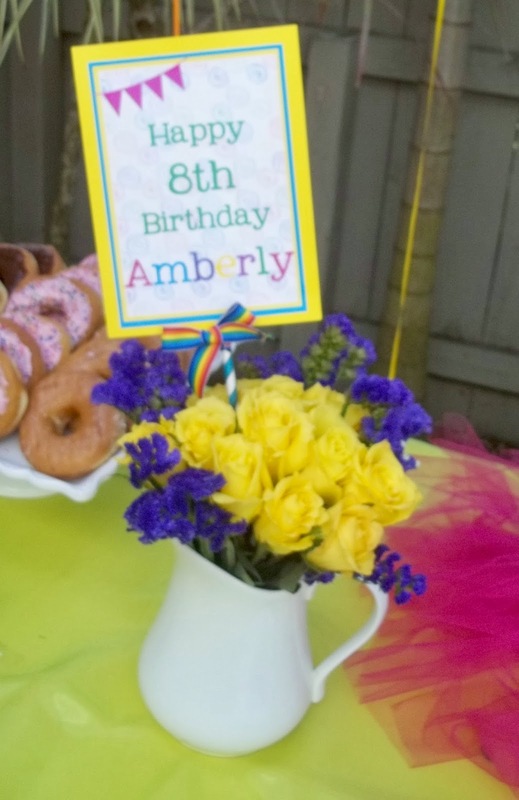 I love love this type of party.. Love the bright colors and that it was outside! 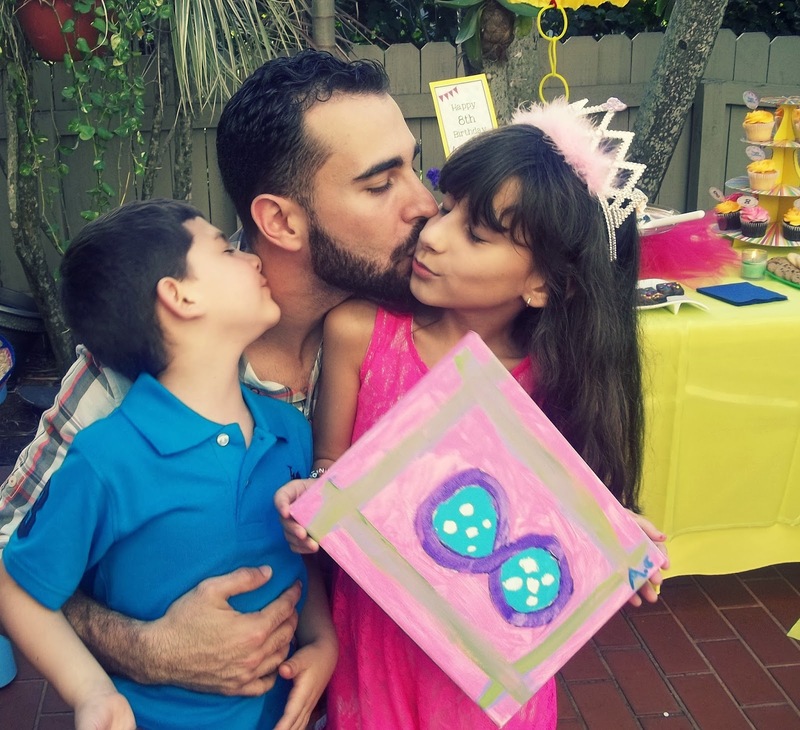 My daughter had an art party and it was so much fun.. not as pretty but fun! This was one of my favorites. So colorful and really, everything goes! I wish I had gotten to paint though! So many great ideas!!! I LOVE all of the colors. Awesome! Super cute! She looks very happy! Amberly is my kind of girl! I love arts and crafts and would have loved this kind of party when I was a kid. My little 12-year-old cousin is the same way... the best gift I ever gave her was a tub full of random craft supplies!